In November 2017, COAR published the report, Behaviours and Technical Recommendations of the COAR Next Generation Repositories Working Group. The report published a list of 19 technologies and protocols that are recommended to improve the way repositories function. You can also browse through the 11 behaviours and 19 technologies/protocols on the Next Generation Repositories website and provide us with feedback on GitHub. We are now in the implementation phase of the project, which is being pursued via three strategies. More information is available on the implementation page. Our vision is to position repositories as the foundation for a distributed, globally networked infrastructure for scholarly communication, on top of which layers of value added services will be deployed, thereby transforming the system, making it more research-centric, open to and supportive of innovation, while also collectively managed by the scholarly community. 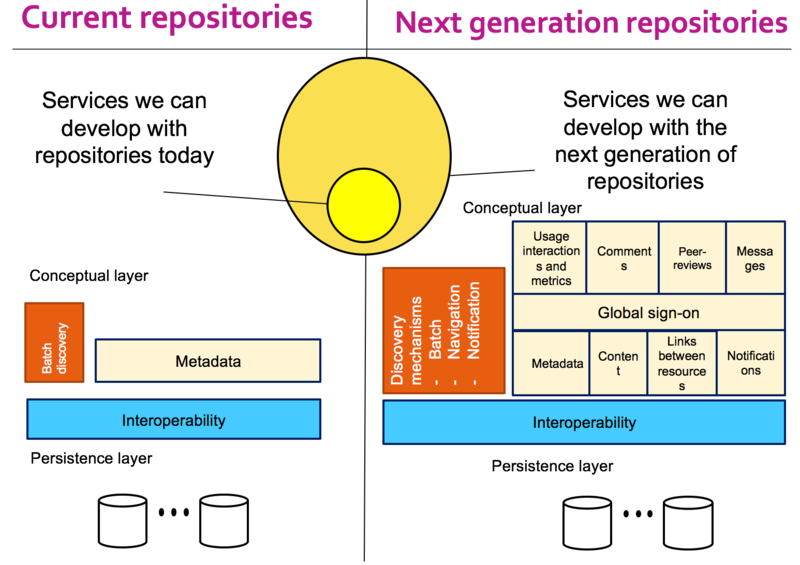 However, in order to leverage the value of the repository network, we need to equip it with a wider array of roles and functionalities, which can be enabled through new levels of web-centric interoperability.